Home kimi_raikkonen Renault courting Raikkonen and Nokia for F1 2010? Renault courting Raikkonen and Nokia for F1 2010? Renault is understood to have held discussions with 2007 F1 World Champion Kimi Raikkonen regarding a potential switch to the French outfit next year – in a move that could at the same time earn the Régie a title sponsorship deal with mobile 'phone company Nokia. 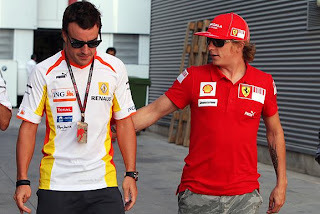 Rumours circulating in France suggest that Raikkonen – who looks set to be out of a drive at Ferrari in 2010 in favour of current Renault incumbent Fernando Alonso, should the Scuderia manage to successfully negotiate the Finn's €25 million pay-off for terminating his existing contract a year early – could do what would be effectively a straight swap with his fellow former title-winner.